The Center for Industrial Training and Engineering Research (CITER), structures and enhances collaboration between industrial partners and SDSU. 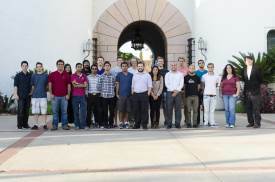 The primary objective is to connect SDSU’s Engineering departments, faculty members, undergraduate and graduate students with engineers and staff scientist of local industry. Through industry funded projects and scholarships, the students get first-hand training in an industry environment and are ready to join the workforce upon completion of their studies. CITER is eager to work with enthusiastic students and engineering companies in the San Diego area.